The ranch is located on the edge of the Blue Mountains in Eastern Oregon where Burnt River and China Creek have year-round flows meandering through the property and creating an oasis for wildlife. There is year-round access with very desirable building sites on a number of locations overlooking the Burnt River Valley to the south. The ranch consists of ponderosa pine and douglas fir on the northern section covering approximately 300± acres of the property, along with pinion pine and sage brush extending into the southern reaches of the ranch. Forest Service property borders the northern portion of the acreage with private holdings bordering the remainder. The property can easily be reached by a county maintained gravel road from the north or the south. The bordering national forest is ideal for four-wheeling in the summer, snowmobiling and cross country skiing in the winter, and trails covering hundreds of miles of back country for exploring. 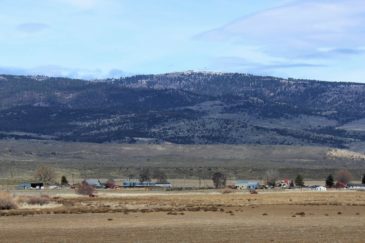 The property is mainly known for its big mule deer, rocky mountain elk herd, estimated at approximately 61,000, is doing quite well on the 2.3 million acre Wallowa-Whitman National Forest that borders the property. Along with deer and elk, there are also bears and the occasional mountain lion. Game birds can been found on the property and are mainly limited to grouse, quail and chukars located at lower elevations. The Unity Reservoir Lake along with Phillips Lake both provide rainbow trout, small-mouth bass and crappie, with perch and Coho Salmon mainly on Phillips Lake. The ranch has traditionally been used as grazing land in the past. There is nearly 71± acres of irrigated pasture and the property is cross-fenced, ensuring viable and sustainable habitat. The irrigated pastures make ideal conditions for growing natural grasses for pasture and can support approximately 60± head of cattle from May through October.